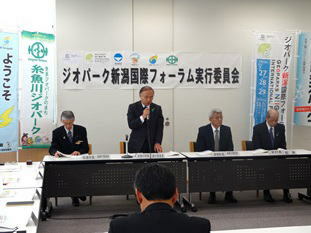 The 2nd Executive Planning Meeting for the Geoparks Niigata International Forum was held on April 12. The plans for the upcoming forum were discussed by representatives from Niigata Prefecture, Niigata Prefecture's 3 Geoparks, Chambers of Commece and Tourism Associations from each geopark region, and new committee members from Niigata University and Niigata Prefectureal University. There are only 3 months until the forum. Registration will continue until the end of May, so don't forget to register.